On April 15, 2019, the Danish Energy received an additional application from Nord Stream 2 AG for permission to construct transit pipelines. There is applied for two route alternatives south of Bornholm on the continental shelf. The application is accompanied by an environmental impact assessment with a number of annexes in order to assess possible environmental impacts in Denmark or cross-border environmental impacts from the project in Denmark. The Danish Energy Agency will now process the application and initiate the environmental assessment process. This includes, among other things, a public consultation of the environmental impact report for the project with accompanying appendices. The public consultation is expected to be initiated shortly and will also include consultation with relevant countries in relation to any cross-border environmental impacts in accordance with the Espoo Convention. Subsequently, the Danish Energy Agency, in cooperation with the developer, shall address the received responses. The length of this part of the case processing will depend on the number, content and complexity of the consultation responses. 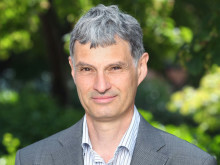 This means that the Agency currently cannot say when a permit can be granted. On April 3, 2017, the Danish Energy Agency received an application from Nord Stream 2 AG for permission to construct transit pipelines in the territorial waters and on the continental shelf southeast of Bornholm. Public consultation of the environmental impact assessment for this route was carried out July - September 2017. On January 1, 2018, a new law came into force, which includes transit pipelines, and thus also the Nord Stream 2 project. The law means that before a permit for a transit pipeline in the territorial waters can be issued, the Foreign Minister must assess if the project is compatible with Denmark's foreign, security and defense policy interests. The case process for the route which was applied for on April 3, 2017, is at an advanced stage, but not yet completed. 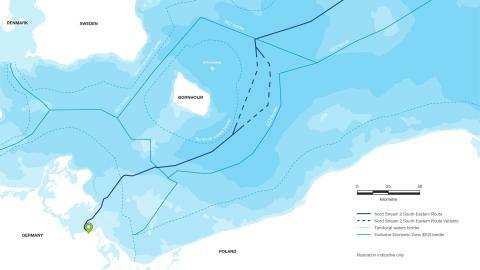 On August 10, 2018, the Danish Energy Agency received an application for permission to construct transit pipelines on the continental shelf North-West of Bornholm. A public hearing for this route was carried out October - December 2018. The case processing of this application is at an advanced stage, but is now awaiting an assessment of the new South-Eastern routes on the continental shelf, see below. An agreement between Denmark and Poland concerning the border south of Bornholm . This means, among other things, that the area will now be available for pipeline construction and thus for a new route for the Nord Stream 2 project on the Danish continental shelf area. In March 2019, the Danish Energy Agency requested Nord Stream 2 AG to investigate a South-Eastern route on the continental shelf. The reason for this request was that the DEA must ensure that a permit to the most optimal route in relation to environment and safety is granted. The immediate assessment is that a south-eastern route is more appropriate based on a number of environmental and safety parameters such as impact on shipping and Natura 2000 areas. On April 15, 2019, Nord Stream 2 AG applied for two route alternatives on the continental shelf south-east of Bornholm. Only one permit can be granted for the project.